• Do not use floor mats designed for other models or different model year vehicles, even if they are Toyota Genuine floor mats. • Only use floor mats designed for the driver’s seat. 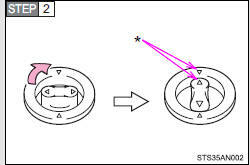 • Always install the floor mat securely using the retaining hooks (clips) provided. • Do not use two or more floor mats on top of each other. 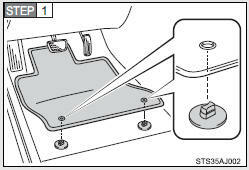 • Do not place the floor mat bottom-side up or upside-down. • Check that the floor mat is securely fixed in the correct place with all the provided retaining hooks (clips). Be especially careful to perform this check after cleaning the floor. • With the engine stopped and the shift lever in P, fully depress each pedal to the floor to make sure it does not interfere with the floor mat.